Yishun Highlights. History & Future Plans. In earlier days, Yishun was home to various pepper and pineapple plantations. Named after industrialist and rubber magnate Lim Nee Soon, Yishun became one of the HDB towns to be developed in the 1980s as part of a project called the Yishun New Town Project. The project was initially allocated 907 hectares of land for public housing and industrial development, but the land area was subsequently increased to over 919 hectares. After resettling the villages that once dotted the area, construction work for Yishun began in 1977. About ten years later, the Yishun Bus Interchange officially opened in August 1987. Later in 1996, the government announced plans to upgrade facilities in the town to include better hawker stalls, shopping precincts and parking lots. In the same year, the Urban Redevelopment Authority (URA) announced plans to sell land in Yishun New Town to build low and medium-rise private houses. Needless to say, the area has since undergone many transformations, starting with the town centre. More recently, Yishun was selected as one of three pilot towns to be rejuvenated under HDB’s Remaking Our Heartland (ROH) plan which was launched in 2007. By 2013, many of the plans drawn up under the programme for Yishun were completed, injecting exuberance and excitement into the “middle-aged” town. The URA Master Plan 2014 revealed further improvements for Yishun. Over the next five years, the area will be reinvigorated with new malls, hawker centres and cycling paths. The transport infrastructure will also be enhanced for residents. The Master Plan highlighted new Three-Generation (3 Gen) flats in Yishun which cater to multi-generational families living together. The flats have been designed to be elderly and wheelchair-friendly, with layouts meant to optimise living space. “Yishun has transformed into a thriving community and has witnessed the launch of numerous new private condominiums, ECs, as well as Build-to-Order (BTO) flats, ever since the Remaking Our Heartland initiative was announced by the government. In addition, the Government is set to support a boost in residential units, private and public by another 18,000 homes, making it one of the most populated towns in Singapore,” Elson Poo, General Manager of Marketing and Sales at Frasers Centrepoint Limited (FCL) said. 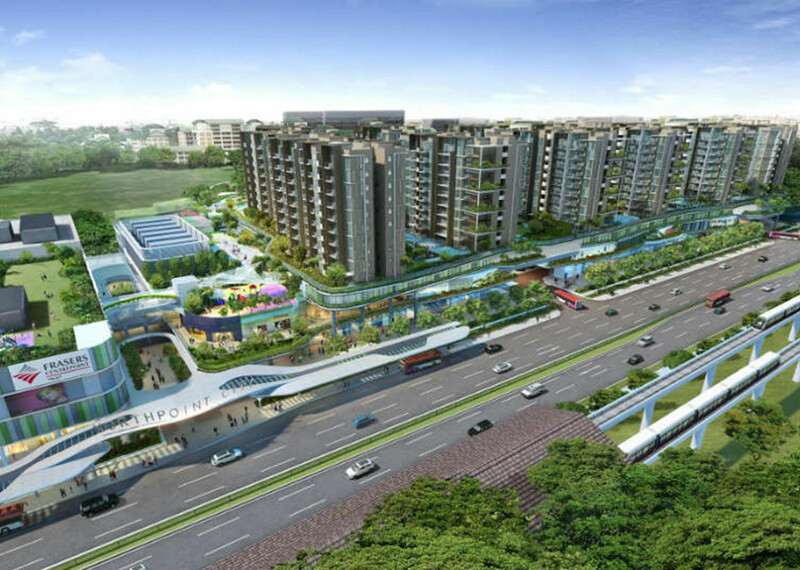 Residents there can look forward to Northpoint City, a new commercial and residential development by FCL in the heart of Yishun which will feature the first Community Club in a shopping mall. Connected to an air-conditioned Integrated Transport Hub (ITH), and conveniently opposite the Yishun MRT station, residents can also enjoy seamless connectivity within the Yishun vicinity and to other regions of Singapore. Slated to be the largest mall in northern Singapore, Northpoint City offers over 500 retail and dining options, with more than double the current retail stores at Northpoint Shopping Centre. Residents at North Park Residences will get to enjoy the lifestyle choices and convenience that Northpoint City offers. It will also include a residential project, North Park Residences, consisting of 12 blocks of 10-storey private residences. Offering units of various configurations from studio apartments to five-bedders, the 920-unit condominium will be ready for launch next year. “Coupled with our 22-year track record in Yishun, we are familiar with the needs of the community and will be able to offer homes which are innovative and exceed the expectations of the buyers,” Poo said. “What is unique to Yishun is the availability of the great outdoors. Residents can enjoy easy access to Seletar Reservoir, Yishun Park and many green spaces and neighbourhood parks which are connected with the expansion of the park connector network,” he added. Indeed, Yishun boasts much foliage and nature. The Yishun Pond, for example, was rejuvenated under PUB’s Active, Beautiful, Clean Waters (ABC Waters) programme and was completed in 2011. Located beside Khoo Teck Puat Hospital, it features a marshland and floating wetlands and lakeside promenade. Designed to be Yishun’s iconic landmark is a three-storey lookout tower ‘The Spiral @ Yishun’ set amidst the lush landscaping of Yishun Pond. It has a 94-metre winding ramp leading to a viewing deck with a panoramic view of Yishun Town Centre. The 17ha and pentagon-shaped Yishun Park also houses the first Dipterocarp Arboretum in Singapore, and the garden was officially opened in July 2008. Visitors can also try out the Canopy Walk at Yishun Park, managed by SAFRA, where they can attempt aerial obstacles five metres from the ground. The famous Bottle Tree Park at Lorong Chencharu will also be improved and is expected to ready by year-end. Recreational and sports facilities are also available at SAFRA Yishun and Orchid Country Club. Yishun offers a comprehensive suite of amenities and services for all ages and is often described as a family-oriented town. To supplement the existing Khoo Teck Puat Hospital, the Yishun Community Hospital is currently being constructed right next to it. Under the URA Master Plan 2014, new nursing homes along Yishun Central and Yishun Ring Road will be available to meet the needs of elderly residents. Additionally, a new hawker centre next to Yishun Park will provide more eating places for residents. Additional transport infrastructure will also be built, including the new North-South Expressway which will reduce travelling time to the city centre, and the new Thomson-East Coast Line. Given its attractive transformation plans, FCL is confident of Yishun’s growth potential. “Yishun is located in close proximity between two primary regional centres; Woodlands Regional Centre and the future Seletar Regional Centre, as well as the North Coast Innovation Corridor. These primary centres offer bountiful employment opportunities, which in turn translate into potential for strong capital appreciation and rental growth for the residential market in Yishun,” Poo said. Residents of Yishun will also benefit from employment opportunities closer to home at the industrial estates along Yishun Avenue 6 and Gambas Avenue. Additionally, the GEMS World Academy, an international school, is currently under construction at the junction between Yishun Avenue 1 and 6. Further along Yishun Avenue 1 near Miltonia Close, two private developments, The Miltonia Residences and Skies Miltonia are expected to be completed in 2015 and 2016 respectively. Even though Yishun may be approaching middle age status in terms of Singapore’s housing history, it seems like its best years are yet to come as the star of the north continues to shine with much vibrancy. Register Now. North Park Residences by Frasers. Register Now. Be Part of Yishun Transformation!